Mrs. Meyer's Clean Day Lemon Verbena Dryer Sheets reduce static, soften and add a bit of garden-freshness. These dryer sheets contain a vegetable-derived softening agent and natural essential oils on a biodegradable paper sheet. The formula is made from 99% naturally derived ingredients like lemongrass oil and fir leaf oil. Pull sheet apart at perforation to reduce risk of blocking dryer vent and toss both unfolded sides into the dryer with your wet clothes. Tumble clothes until dry; then enjoy your fresh, garden-kissed clothes. 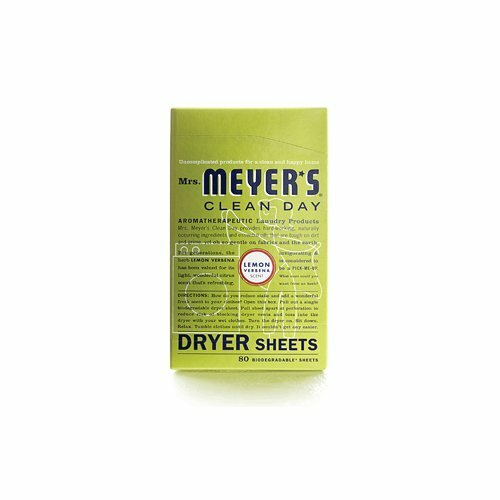 Mrs. Meyer's Clean Day Dryer Sheets is hard working, biodegradable, and environmentally friendly. Ingredients : Product Ingredients are at least 99% naturally derived. Ingredients: Di-(Palm Carboxyethyl) Hydroxyethyl Methlammonium Methyl Sulfate, Palm Fatty Acid, Fragrance*, Citrus Medica Limonum (Lemon) Peel Oil, Abies Alba (Fir) Leaf Oil, Cymbopogon Schoenanthus (Lemongrass) Oil. * More information on this ingredient is available in the Environmental and Safety section of Company Information.